A Student Learning Objective (SLO) is an academic target based on student performance throughout a course of study. Teachers will set specific and measurable targets for students learning at the start of a course or by the end of the first marking period. These targets are goals that all students should strive to achieve by the end of the year. The target represents the big ideas for the year as defined by the Pennsylvania Department of Education’s Standard Aligned System (SAS) site. 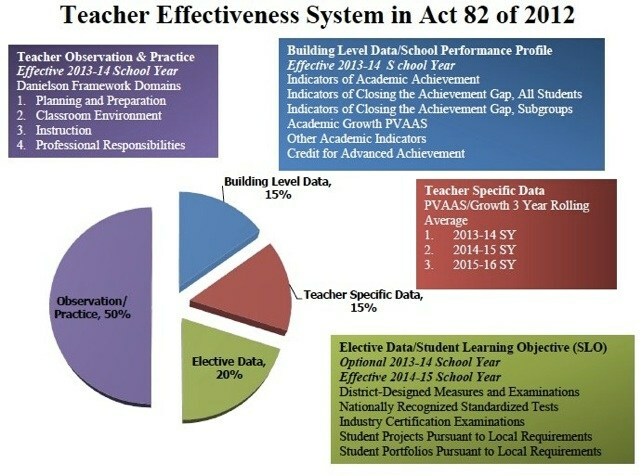 The Pennsylvania Department of Education has committed to the transformation of the teacher and principal evaluation system. Included in this legislation is the creation of SLOs starting in the 2014-15 school year. SLOs require teachers to use data to align instruction in their short and long term planning. The process of setting SLOs encourages educators to focus and align instruction with school, district, state, and national initiatives for improving student achievement. The purpose behind the SLO project is to create a formalized process to what teachers are already doing; using data to drive their own instruction. One of the major goals of the SLO project is to identify a “Big Idea” from the Standard Aligned System (SAS) site and set targets of performance based off of assessments. This process will provided teachers with a deeper understanding of the root causes behind student successes and shortfalls in their class. Again, this is a process that teachers are already engaged in data, progress monitoring and making instructional adjustments. This is just a new, formalized process.